The fifth annual Brand Footprint report from Kantar Worldpanel looks at which brands are being bought by the most Chinese consumers the most often. The report is based on research from 73 per cent of the global population; a total of one billion households in 43 markets across five continents—covering 75 per cent of the global GDP. The latest China ranking has revealed that Chinese brands dominated the top 10 most chosen brands’ list and also have taken up 9 out of 10 places for fastest growing brands. 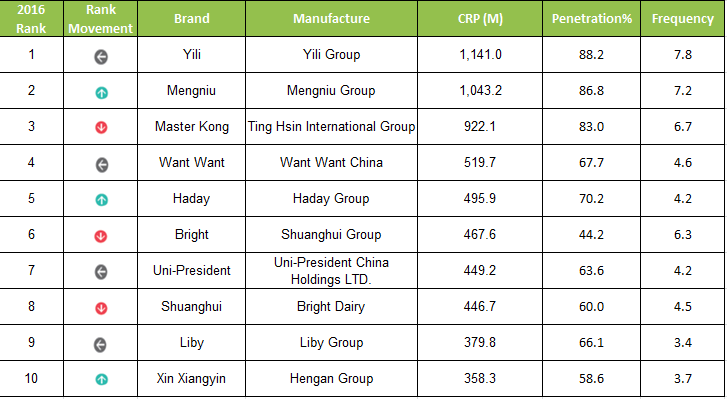 Yili continue to top the list, followed by Mengniu moving up by one place from last year. While 2016 was a difficult for FMCG industry as a whole, both brands maintained their ability to touch shoppers’ lives day in and day out over 1 billion times. Xin Xiangyin, a paper brand under Hengan Group, expanded its consumer reach considerably through adjusting its product lines. It made the list of the top 10 brands for the first time with 358 million consumer reach points last year. In 2016, 58.6% of urban families in China bought the brand for 3.7 times on average. There was significant change to the list of the top 10 fastest rising brands. Nongfu Spring, Luhua, Lee Kum Kee, Chaoneng and Lay’s all made to the top of the league for the first time. Nongfu Spring was the fastest growing brand with consumer reach point up by 43% year on year, thanks to its new innovation to expand shopper base. 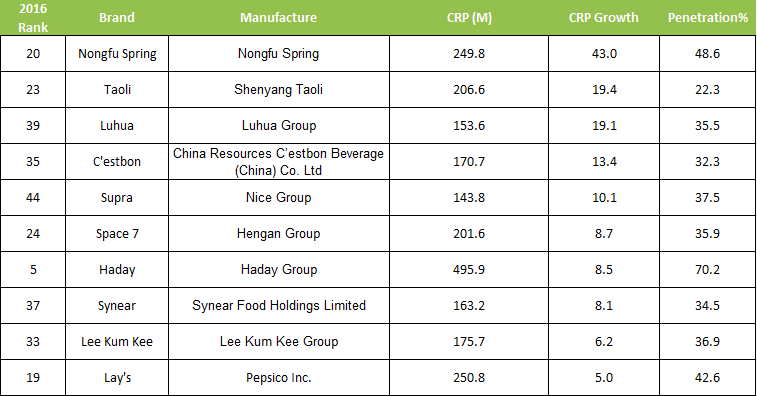 Luhua not only joined the club of top 50 for the first time, but also became one of the top 10 fast rising brands, with 19% increase in consumer reaches year on year. Kantar Worldpanel’s analysis also shows that, with developed markets barely growing, emerging countries were responsible for all of the FMCG value growth in 2016, adding $34 billion to the global industry throughout the year. 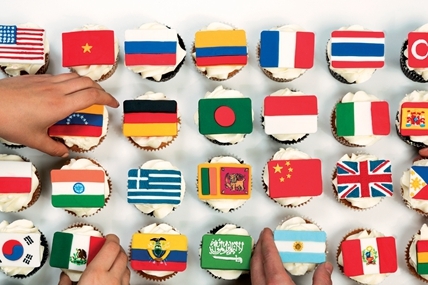 Kantar Worldpanel’s Brand Footprint Ranking reveals the strength of brands in 43 markets around the world, across the food, beverage, health and beauty and homecare sectors. It uses an insightful metric called Consumer Reach Points which measures how many households around the world are buying a brand (its penetration) and how often (the number of times shoppers acquire the brand).